Mike Papantonio is joined by Ralph Nader to discuss tort law in the United States, including big business’ efforts to completely dismantle the tort system. Papantonio:	One of the few ways in the US to achieve justice if you’re harmed by a product that can kill and cripple is through our civil justice process. These kinds of cases, commonly referred to as tort actions, allow people to receive compensation for injuries or illnesses they’ve sustained due to corporate negligence or intentional conduct. While modern tort law has been around in the United States since at least the 19th century, only in the last few decades has there been such a huge effort to close the doors to the courthouse for injured victims. 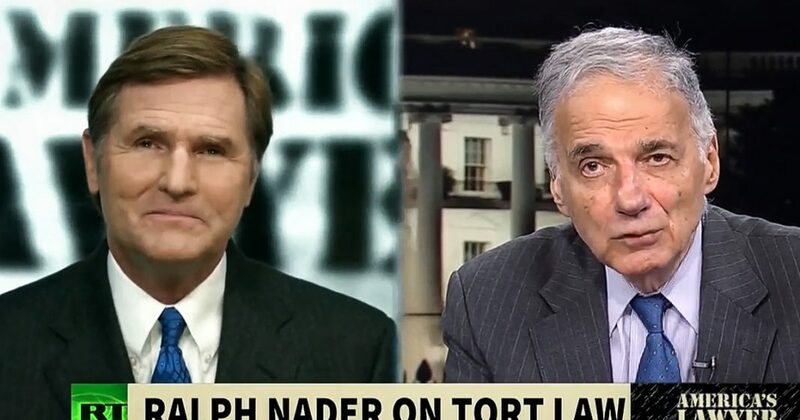 Joining me now to discuss the future of tort law and big business’ efforts to destroy that tort system is probably one of the most important social engineers in this country, Ralph Nader. Creator of the American Museum of Tort Law and the author of the book Breaking Through Power, Ralph Nader. Thanks for joining me, Ralph. Nader:	You’re welcome, thanks Mike. Papantonio:	Let’s begin by explaining who has the biggest interest in closing the doors to the courtroom for American consumers if they’ve been injured by defective products or they’ve been defrauded by Wall Street, or their quality of life has been decimated because of pollution. Who has the biggest interest in closing the doors to the courthouse? Papantonio:	You know, by the way, I’ve been following your museum in Connecticut. What an incredible idea. I say that, Mr. Nader, because typically corporate media doesn’t tell the stories behind what it’s taken to make safe products in this country. They don’t talk about the cases that you’ve handled over the years and how it’s made such a big impact in this country, as far as making products safer. Your museum, I think it’s extremely interesting, is now focusing on that. People ought to know about this. Tell us about it. Nader:	Well, it’s a major liberation movement in America back coming from medieval England where someone wronged someone else and there was no court, no trial by jury, so they went to revenge cycles. They set up these courts and trial by jury. We took it in the young republic in our country, and we took it to the highest level in the world. We have the best law of wrongful injury in the world, which is why the corporations want to destroy it one injury at a time. They want to block the courtroom door, they want to get rid of jury trials. They want to get rid of class actions where consumers can band together as a class that’s been harmed individually to get justice, get deterrents, to get disclosure, to get the government to issue safety standards that are long overdue, to get those politicians in Washington and elsewhere to be sensitive to the millions of people who are wrongfully injured. Papantonio:	Mr. Nader, the myths that have been created by organizations like the US Chamber of Commerce in regard to issues like punitive damages or issues like, the idea that jury awards are affecting the economy, or we also hear that the system is a lottery. How do you respond to that after the many years that you have been out there fighting for American consumers? How do you respond to that? Nader:	First, there aren’t enough lawsuits. It’s very hard to win a lawsuit against a giant company like Ford or Exxon Mobile because it has to go through all kinds of hoops. You got to get a lawyer, you got to go to court, you’re going to be opposed by corporate lawyers who have endless resources. You got to convince the judge, you got to convince the jury. If you don’t convince one jury in some states the bad guys win. This is very, very difficult, and it’s all open. Anybody can walk into a courtroom. The press is there. If you appeal, the same thing. It’s the most refereed process of all the three branches of government where they cut deals and legislators behind closed doors, or the executive branch bureaucracy, you can’t figure it out. The court of law is the people’s key to justice. If we don’t realize that we’re underutilizing the law of torts, the law of wrongful injury, just a few months ago Johns Hopkins University Medical School, the doctors put out a report saying that 5,000 people a week die in preventable situations in hospitals; hospital induced infections, malpractice, et cetera. That’s 5,000 Americans a week, and only a tiny number of them every get any justice or compensation. Anybody who tells you we are a litigious society, it is true when it comes to suing corporations on patents and other things, but we are grossly underutilizing this great system of justice and trial by jury. The more we utilize it the less Medicare has to pay, the less social programs have to pay. You make the wrongdoer pay and you make the wrongdoer change the practices so you don’t have to keep paying again and again. Papantonio:	Mr. Nader, there are attorneys all over this country like me who decided to do what we do because of your work. I want to be very frank with you. Had it not been for the work that you did and we could see the good that you accomplished, there are many lawyers that would have said, “This is not the place for me.” You’re one of the reasons I chose to do what I do, and there are many, many lawyers throughout this country. I know this is a broad question, but I want to ask you, what is one of the most important things that you think you’ve accomplished over these years as America’s best consumer advocate by far? What sticks with you the most? Nader:	Well, health and safety standards are much improved, all the way from the coal mines to the highways to the hospitals, because lawsuits disclosed all this wrongdoing, all this negligence, sometimes corporate crime. Then the regulators or congress issued safety standards, recalled millions of products, we know that, we see that in the media. Just in the auto area alone according to the Center for Auto Safety, Clarence Ditlow is the director, is an engineer and lawyer, he estimated earlier this year 3.5 million prevented deaths in this country due to the Motor Vehicle and Highway Safety laws that were passed in congress, signed by Lyndon Johnson in 1966. A lot of that wouldn’t have happened without litigation taking the lead and disclosing how the tire companies didn’t adequately test their tires. That information was brought to Senator Nelson in the US senate. He put in a tire safety bill which became law. If we don’t keep those courtroom doors open and if we don’t learn about this great liberation movement, if we don’t protect the precious right of trial by jury, we are going to have a more hazardous society. More people are going to lose their lives and get injured and get sick. That’s true for the environmental area, for the marketplace of products, also true for the workplace. That’s why we opened the American Museum of Tort Law. If you go to tortmuseum.org you’ll see what a great experience it is. We want to have touring exhibits all over the country and be able to stream out of a proposed courtroom we want to build for that purpose all kinds of activities that tell you how you can make your life and the life of your family safer, more secure, more just by using the law of torts which comes down from our founding fathers. Papantonio:	Mr. Nader, in about a minute, most Americans believe that government is there to make things safe. They believe that a regulator with the EPA or the SEC or the FDA is there to make them safe. Then they say, “Well maybe if they’re not doing their job, maybe corporate media will do their job. Then maybe if they don’t do their job, some judge in a federal court that’s been appointed by a conservative president, maybe they’ll do their job.” The truth is, at some point, do you give the impression that the last chance for a consumer who’s been wronged these days is a court of law? Your thoughts? Nader:	Absolutely. We shouldn’t be inhibited from using our courts. They’re all over the country. Taxpayers fund them. The doors should be open. There’s a 200-plus year tradition of gradual expansion of the rights of wrongfully injured people and children. That’s part of our freedom, freedom to sue the wrongdoer, to hold them accountable. To bring justice to millions of people through class actions, through deterrents, through disclosures. How did people find out about the VW manipulation? How’d they find out about GM ignition switch? Started in the court of law. An injured person found a lawyer on a contingent fee, only gets paid if the lawyer wins for you. Then in an open court of law; no censorship, no secrecy, no back doors, transcripts, the press there, millions of people learned about it. This is the most precious institution in our country. It has the most important democratic institution, which is trial by jury of your peers. Papantonio:	Thank you. Thank you, Mr. Nader. America owes a big debt to your efforts on behalf of consumers, and we’re all grateful. Thank you for joining me. Okay? Nader:	You’re very welcome, Mike. Keep it up.